The Balat district, between Ayvansaray and Fener, was the most important Jewish settlement in Istanbul during the 17th Century. Some claim that its name derives from a Turkish rendering of the Greek "palation," or palace, owing to the presence of the nearby Blahernai (Vlaherna) palace. The Balat district, between Ayvansaray and Fener, was the most important Jewish settlement in Istanbul during the 17th century. Some claim that its name derives from a Turkish rendering of the Greek “palation,” or palace, owing to the presence of the nearby Blahernai (Vlaherna) palace. According to others, the name derives from the old, Western Anatolian city of “Piletos,” from which many of the districts Roma population had migrated. The first Jews to migrate to the district were one hundred poor families from the Macedonian city of Kasturiya. In the years after 1492, Sephardic Jews from Spain and Portugal also began to settle in the area, and Jews migrating from Rhodes in 1599 were also hosted here. At first the Romaniotes, – or original Jewish inhabitants of the Byzantine Empire – and the Sephardic migrants remained separate, with their own traditions and synagogues. However as a result of numerous natural disasters and population growth, the two communities gradually grew together and merged. The Alliance Schools which opened for boys in 1875 and girls in 1882 were an important guiding force in the neighborhood until the Great Balat Fire of 1911. According to a regional report written by school administrators, the area’s Jewish population at the time was employed as fish and fruit vendors, porters, and in water transport and in local cafes. A portion was destitute and relied on begging. At one point there were seven separate autonomous religious (Hachgaha) zones in Balat: Sigri, Karabaş (Lonca), Dubek, Ahrida, Kasturiya (Tekfur Saray), İstipol (Selma Tomruk) and Tahta Minare. The Jewish population of Balat began to decline significantly, particularly after the 1894 earthquake and a number of related fires, as families with the means moved to more modern districts of the city and poorer residents migrated abroad. In 1965 there were still 640 Jewish families living in Balat. However only two years later, in 1967, that number had fallen to 160 and by 1978 only some 60 families remained. Today only a handful of Jewish families continue to live and work in the area, generally with the help of mutual aid societies. There have been countless synagogues active in the district, whether they existed at the time of the conquest of the city or were added later. Among the synagogues founded by those first settling the district were the Geruş, Messina, Montias, Neve Şalom, Ahrida, Yanbol, İstipol, Çana, and Kasturiya synagogues. Later other synagogues – such as Balat de Afuera, Pol Yaşan, Pol Hadaş, Hevra, Eliyau, Selaniko (Siğri), and Veria – were built on the outskirts of the district. Of all of these today only four remain: the Ahrida, Yanbol, Istipol and Çana synagogues. According to an historical document dated May 21, 1693, the Ahrida (Ohrida) Synagogue had already been in service for around 550 years and took its name from the Macedonian town of Ohrid from which its founders had migrated. It would wrong to think, however, that today’s building is the same as its 6th-century predecessor. According to one claim, today’s structure was in fact built on two separate synagogues, located next to each other, whose walls were knocked down and whose interiors were joined. The expert architect, Hüsrev Tayla relied on a number of sources – including archival documents recalling the architectural styles and decorations of the era, a number of other existing buildings from the same era, as well as other synagogues from various periods – in order to develop a flexible approach to 1992 restoration work he oversaw. 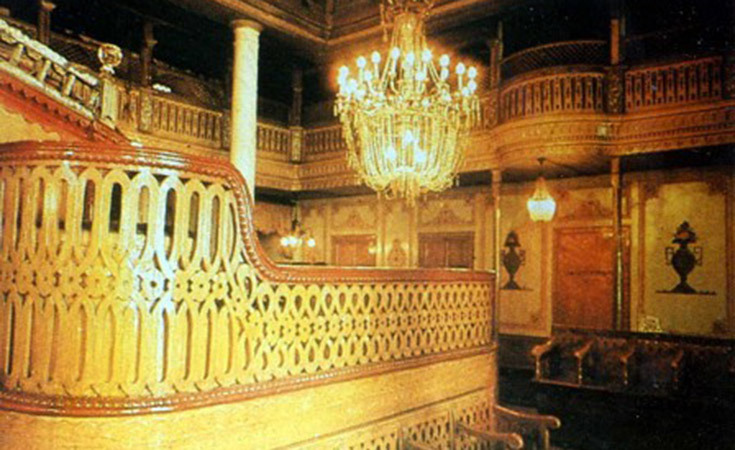 Located on Kürkçü Çeşme Street, the Ahrida Synagogue is the largest and most impressive of Balat’s synagogues. The synagogue is constructed of stone masonry and brick, and its floor is covered by marble. The bema (Turkish: teva), built on a foundation flanked by two steps, resembles the prow of a ship. According to one belief this is meant to recall Noah’s Ark, and according to another claim it is a symbol of the ships that brought the Sephardic Jews from Spain to the Ottoman Empire. The Torah Ark (Turkish: Ehal) – with its colorful relief decorations on its interior doors and its inlaid pearl exterior doors – is approached by three marble stairs. There is also a Midrash (Turkish: midraş), or small religious school, located in the synagogue’s garden. In the course of the 1992 restoration, the original ceiling decorations were found under the dome’s covering. Closed for two years, the synagogue was officially reopened on November 19, 1992. 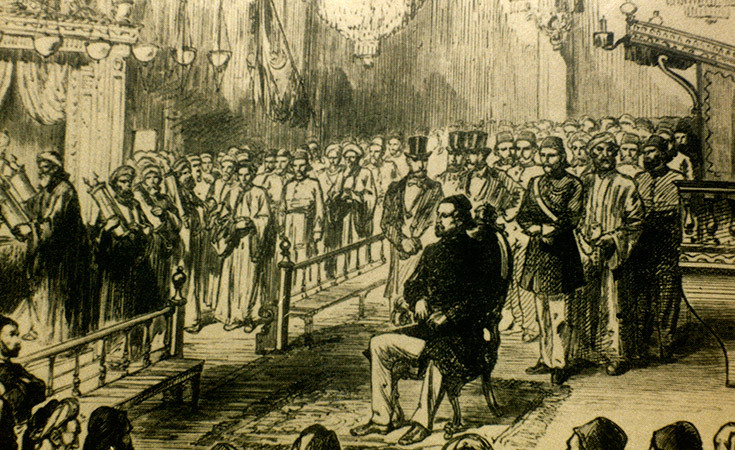 In addition to the numerous weddings, Bar Mitzvas, and community events carried out here it has also hosted other services such as a ceremony held on May 18, 1877 to commemorate the Ottoman victory in the Ottoman-Russian War, to which Sadrazam İbrahim Edhem Paşa was invited. 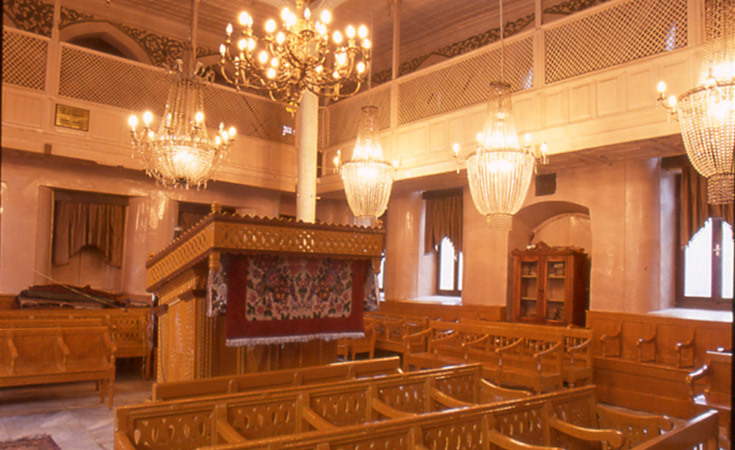 The Ahrida Synagogue, which was taken under official protection by the the Law for the Protection of Culture and Heritage on September 16th 1987, also has a replica in the Miniatürk museum.